Last Weekend, I was accompanied one of my student to join a draw and tell competition. 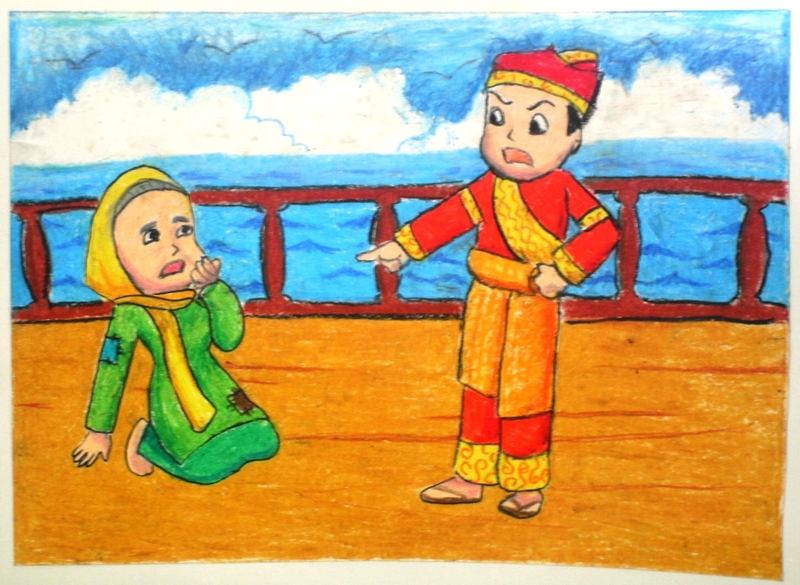 It was a package of competition, where the participants are encouraged to draw an illustration (or a set of illustration) of Indonesian folk tales, and re-tell the story in English. It was interesting. 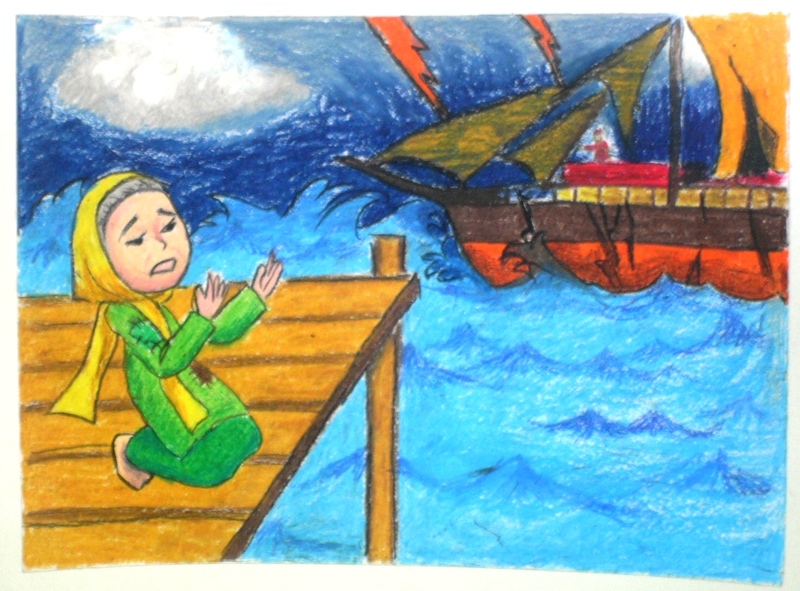 I asked my students in Secondary 1 to make a set of illustration for the competition (yes, the student who will tell the story doesn’t have to make the drawing by herself). In the beginning, we have a short discussion about the folk tales, since we have to choose from many folk tales available in Indonesia. We agreed to choose Malin Kundang, a folk tales from West Sumatra to be developed. We divided the class into 3 groups, and each group must draw an episode from the story/folk tales. They did their best and tried to draw quite similar characters for their drawings. Vania’s group finally finished their work and submitted to me on time. The other groups did not do it very well, so finally I (feel responsible for it) finished the drawings for the competition. Malin Kundang denied his own mother. On Saturday, I accompanied Rinad to Bale Seni Barli for the competition. 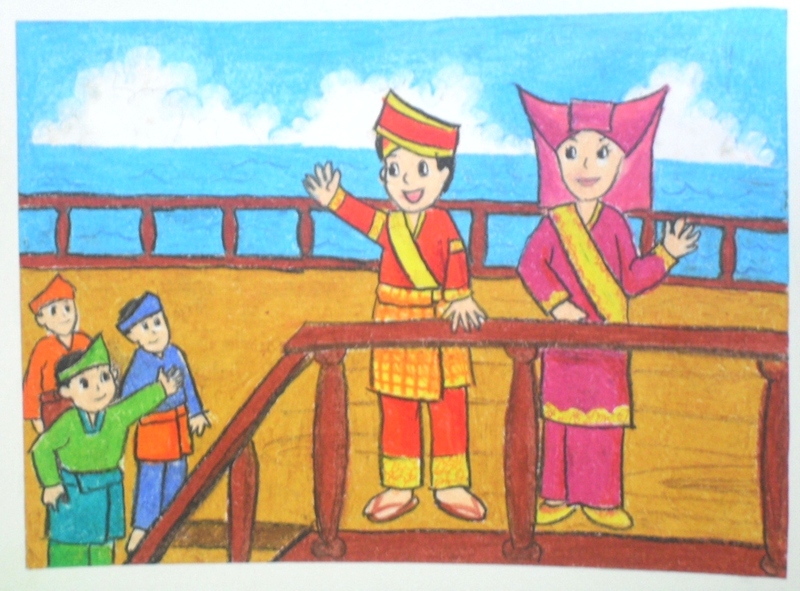 She dressed up like Minang woman, with plaid sarong and baju kurung (a kind of tunic). She was telling the story well, and we were so optimistic that she would go to the final round on Sunday. And yes, she was selected as one of the finalist. She practice many times on Saturday night and surely did better on the final round, for her pronunciation was very good, gesture, interactive with the audience, and she pointed to the pictures too to show the audience about the connection between the story and the drawing /illustration. She had some good competitors, and I think it is quite difficult to choose the winner for the competition. But when it was announced… she got first prize!!! Alhamdulillah. Thanks to her classmates who did some good works for the drawing (well… I did quite a lot of work on it too). Glad that we won this time. Next time, we might win another competition 😉 Insya Allah. 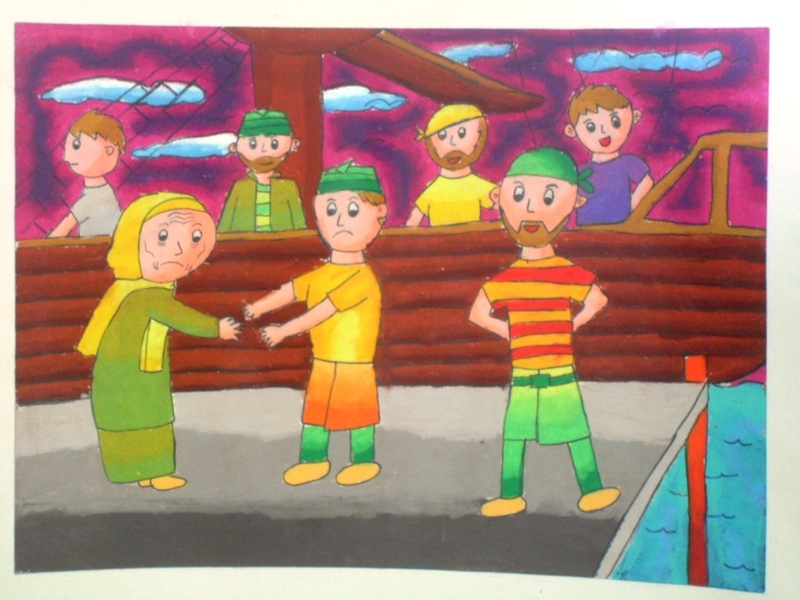 This entry was posted in Achievement, student's works and tagged Achievement, artwork, Bale Seni Barli, competition, culture, drawing, folk tales, Secondary, student, teacher. Bookmark the permalink.